A Solo Adventure for Tunnels & Trolls, open to player-characters up to 6th-level of experience with no more than 160 personal adds. 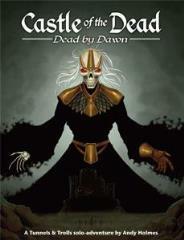 Any character type may enter the Castle of the Dead, but the use of magic is limited and warriors are best suited to this adventure. Castle of the Dead represents a strong challenge, and you must be aware before entering that it is a very tough solo scenario, but it is balanced with great rewards for those who emerge alive.